Father David Bu Nyar, 43, sits at the table with his arms crossed in the Myanmar manner of showing respect. Also in the Myanmar manner, he gives soft-spoken answers. His gentle tone belies the violent nature of the topic. When asked if refugees from his war-torn country of Myanmar (formerly Burma) have possibly seen fighting, violence, the destruction of villages or even killing, Father Bu Nyar answers a soft-spoken “yes” to each. He calmly admits that even he has witnessed fighting in his home town of Demoso in his younger days. 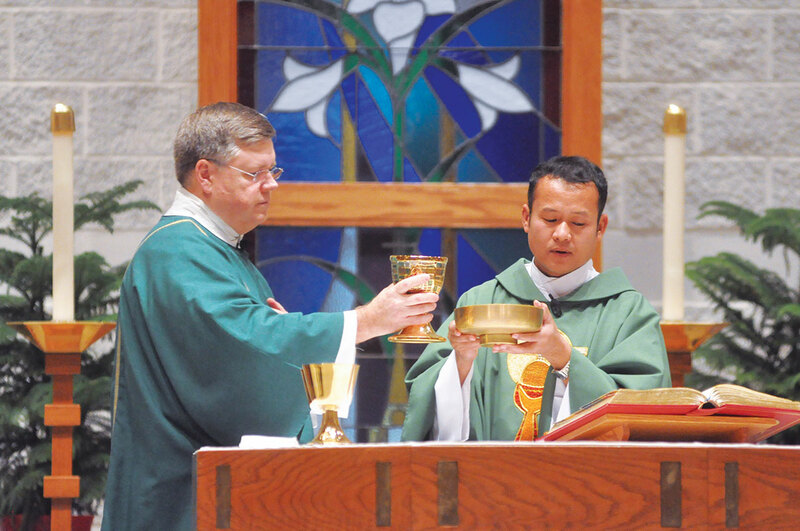 He estimates that about 1,000 Myanmar refugees now practice their Catholic faith at St. Mark the Evangelist and St. Pius X parishes, both in Indianapolis. He has come to minister to them. “Cardinal [Joseph W.] Tobin saw the need of [the] Burmese Catholic Community in Indianapolis,” he explains. Last year, then-Archbishop Tobin contacted the bishop of Loikaw in Myanmar, asking if it would be possible to send a diocesan priest to serve the Catholic Myanmar refugees in the Archdiocese of Indianapolis. Father Bu Nyar arrived in Indianapolis in early December to temperatures far colder than the 90-degree weather typical for Myanmar at that time of year. During his three to five years of ministering in the archdiocese, he will call St. Pius home. He is of the Kayah tribe and speaks Karenni, as do the majority of the refugees from Myanmar at St. Pius. But Father Bu Nyar will celebrate Mass and other sacraments at St. Pius and St. Mark in the official Burmese language spoken by all from Myanmar regardless of tribe. He will also celebrate Mass in English. But celebrating the sacraments are far from his only duties. In addition to those duties, Father Bu Nyar will serve as associate pastor of both parishes and as coordinator of the Myanmar Ministry for the archdiocesan Intercultural Ministry Office. “He is a gift to us,” says Father Todd Riebe, pastor of St. Mark Parish. “We are so grateful for his presence here. Father James Farrell, pastor of St. Pius Parish, expresses similar sentiments. “This has been a great gift as far as the Burmese community is concerned, and me too,” he says. “Many of the elders don’t speak English well, if at all. It’s important to have him to celebrate the Mass. It’s been a wonderful expression of the Church’s care for them now that they’re in a new country after years in refugee camp. Both Burmese and English-speaking Catholics are grateful for Father Bu Nyar’s presence as well. Angela Dim, a Myanmar refugee of the Zomi Chin tribe and a member of St. Mark Parish, says she is “so excited” to have a priest from Myanmar. So do her fellow parishioners, Mary Ellen and John Magee. Mary Ellen serves as a realtor for the Myanmar refugees of the parish. “They’re very dear to my heart. I love the diversity they bring—it warms my heart. I think it’s wonderful” that they have a priest who speaks their language, she says. John, an officer of the local Knights of Columbus Msgr. Downey Council 3660, is excited about a new Burmese Knights’ council that is developing. “A lot of them wanted to join,” he says, but because of the language barrier, “our district deputy decided it would be better for them to have their own council.” Father Bu Nyar will serve as chaplain of the new council. Lauren Jones worships at St. Mark Church with her boyfriend Peter Kim, a member of the parish and a Myanmar refugee of the Zomi Chin tribe. Kim notes that the refugees still learning English have come to Mass despite the language barrier “because of the Eucharist.” Now, he says, that barrier is gone.